Expand your mind, or your warehouse… – Canadian Rack Inc. Instead of moving to larger premises or expanding your facilities, building a mezzanine can be a surprisingly cheap way to expand your space. Structural mezzanines or raised platforms are designed and installed to fit a specific area of a warehouse. Structural mezzanines can be single or multilevel and are often installed inside manufacturing and processing plants, retail stores, office buildings, industrial plants, warehouses, distribution centers, and more. A structural mezzanine adds a second or third level inside the facility and thereby doubles or triples the existing footprint. 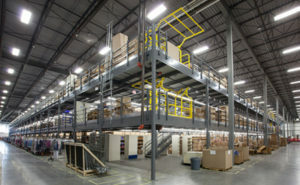 Mezzanines enable new production, office, storage, assembly, locker rooms, parts departments, stockrooms, cafeterias, company records storage, and work platforms. Determine how you plan to use the mezzanine. One of the first things you want to look at is where the mezzanine is going to be located inside your facility. You will need a clear height under steel of at least 14ft. 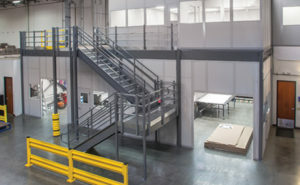 Will the mezzanine be used for storage, In-plant offices, assembly, picking or support? Or will it be used for multiple applications? Will the mezzanine be tied into an existing production line or assembly process? Should future expansion be considered in the initial design? What are the mezzanine capacity requirements? Think about what is going on top of the mezzanine taking into consideration both present and future needs. A mezzanine for light storage might have a load capacity of 125 pounds per square foot (PSF); heavy storage, 250 PSF; whereas an equipment platform might only have a load rating of 60 PSF. As well, how will you be moving material up on the platform – will you be using pump trucks, shelf carts, conveyor, etc? Will you need a drop station for full pallets? While at this stage you won’t actually be designing the mezzanine, you will need to have a general idea of the clear areas required under the structure. Perhaps you have an existing manufacturing operation on the floor level that you do not want to change or interrupt – the column layout should accommodate this need. However, fewer columns mean higher column loads, and therefore an increased likelihood that you will need concrete footings. In the final analysis, the need for fewer columns should be weighed against the need for clear area and the potential cost of new footings. This is sometimes a chicken and egg scenario. If you do not have the original information regarding the floor slab and subsoil from the builder, a slab and soil analysis may be required. Application requirements will greatly affect the design and subsequent mezzanine column loads so it is critical to find out early if your slab will provide the necessary support. If you are just looking to get budget numbers on your mezzanine, and the structure does not have high loads, you may skip this step until you decide to proceed with the purchase. 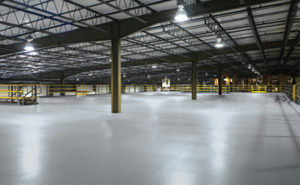 Mezzanine column base plates need to be sized appropriately relative to specific column loads and floor slab capacity. Be aware, however, that with extremely high column loads or low floor slab capacity, even large base plates may not eliminate the need for concrete footings. There are many types of flooring that can be used on a mezzanine. Most commonly used floors are made with corrugated roof deck covered with tongue and groove plywood. There are specialty floors that have a resin coating designed for higher traffic, as well as floors made with bar grating to allow air, light and sprinkler water access to the lower level. Powder-coated components tend to be extremely durable and more visually attractive than typical air dried enamels. Powder coat paints are also available in a variety of colours – this may be important if your mezzanine is grouped with other structures (pallet racking, shelving, conveyors, carousels, etc.) inside your plant and/or accessed by customers (as in product showrooms). Is the mezzanine over-designed or under-designed for your application? At times, an end user may contact a local steel fabrication shop to build a mezzanine. Often this results in an over-designed or under-designed mezzanine. An over-designed mezzanine will be more costly because more steel is used; an under-designed mezzanine could result in structural failure and a potential collapse. A properly engineered mezzanine will use as little steel as possible to get you the capacity that you need. The final design should maximize material efficiency for optimum strength, using the least amount of material to achieve the desired capacity. Make sure your mezzanine design meets all applicable building code requirements, as this will ensure a smooth permitting process. Permits for these types of structures are highly recommended, as not only will there be structural requirements but other issues like lighting and potentially the addition of sprinklers underneath the platform. A professionally engineered and PE-stamped mezzanine will ensure you of a structurally sound design. PE-stamped drawings should specify the mezzanine layout, column placement, stair runs, gate locations, connections, and all other details. All drawings and calculations should be stamped by a licensed professional engineer to assure you of total safety and structural integrity. This will also provide you with peace of mind that your mezzanine is safe and built to code. While permits typically add time (and aggravation) to delivering the project, PE-stamped drawings and calculations will in most cases expedite the permit approval process.